This book chapter presents a structured approach to assess supply chain practices. The proposed solution incorporates sustainability dimensions into the evaluation process—considering social, economic and environmental impacts—and can be applied to select supply chain practices that can help to reduce the negative impact of transport, while improving long-term economic performance. Although there is no universal practice that can be applied across all business and national contexts, based on the extensive analysis of various supply chain practices across Europe, the most common ‘generic’ solutions used to improve supply chain are presented. The analysis of each ‘generic’ practice includes its social, economic and environmental impact, as well as its drivers and limitations, which should be considered when new implementation takes place. 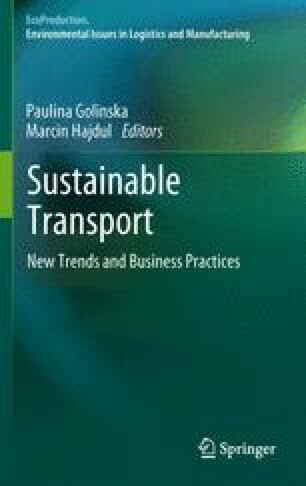 The work presented in this chapter was completed within the European Commission BestLog (Best Practices in Logistics) project. The project consortium included: Technische Universitat Berlin, Logistics Department; University of St. Gallen, Chair of Logistics Management; METTLE Groupe; Reliant s.r.l. ; Warsaw School of Economics, Logistics Department; Packaging, Transport and Logistics Institute (ITENE); Saïd Business School, University of Oxford; Chalmers University of Technology and European Logistics Association.